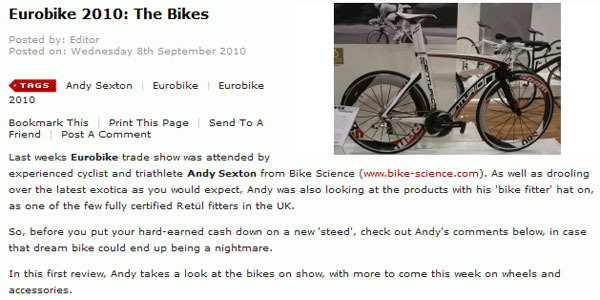 A trip to Eurobike last week meant the ultimate “Busmans Holiday” for Bike Science Head Fitter Andy Sexton. Bikes, everywhere you look! More carbon and Ti “bike p0rn” than you can poke a stick at. Read the first of our Eurobike show reports over on the Tri247 Website and look out for a few exciting new products appearing on the Bike Science site soon. This entry was posted on Wednesday, September 8th, 2010 at 12:53 pm	and is filed under All Posts, Bike Fitting, Products. You can follow any responses to this entry through the RSS 2.0 feed. Both comments and pings are currently closed.